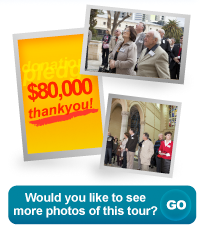 This was the first of two special events to acknowledge and thank generous supporters of our St Mary's Cathedral Appeal. His Grace was overseas and unfortunately could not attend this event, however we are indeed grateful to Bishop Don Sproxton for acting as the Host, together with Monsignor Keating and Mr Tony Howarth. Back to the tour...I must say that guests were simply "blown-away" (as one guest commented) by the marvelous restoration and construction work, there were "ooh's and aah's" and lots of smiling faces. From the feedback received, guests thoroughly enjoyed the afternoon. During afternoon tea, served in the new but not quite ready Parish Centre, Monsignor Keating congratulated and thanked everyone for their generous gifts to our Appeal. He advised that we had raised $27.3 million in pledges and donations thus far, which was a remarkable achievement in itself. Monsignor said that we must raise an additional $5.6 million to successfully complete St Mary's Cathedral. 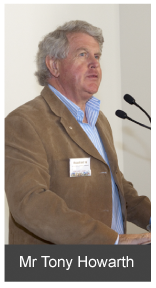 Tony expressed gratitude for the guests generosity and urged them to consider making a further contribution to help achieve our historic target of $32.9 million by the opening date of 8 December 2009. Tony also took the opportunity of congratulating Monsignor Keating on his appointment as the Dean & Administrator of St Mary's Cathedral, which will be effective immediately following the opening.